Would anyone know if the wipac alternator used on the lightweights are single or 3 phase? The original wipac is 3 wire, they are not available anymore but can be rewound, or the Lucas item will fit although the clearance is a bit greater I think. Al Osborne is the man to ask about all things electrical! I quite like the idea of CDI ignition athough a 12 v conversion and Boyer works well enough for me! Thanks for that but do you know if the original was single or three phase? I can't imagine that it was anything other than single phase. Just be gratefull its not an early Ducati as some their ideas are off the planet. According to the F Neill book, it is single phase. Like the heavy twins the output was from either 3 or 6 of the stator coils in series depending on whether or not the headlight was on. We really need a "real electrician" - (AL O) -to tell us the difference when referring to a bike alternator. In mains electricity single phase is 230V and three phase is 415V. So the difference here is important ; you can't use three phase equipment on a single phase supply (without special inverters). I once drilled and blew a 415v 3 phase supply and put a factory out of action till a 120 amp fuse could be found. I can assure you its nothing like a Wipac alternator!!. I don't doubt you for one moment, Robert. I think the Wipac alternator is single phase 6 volt (which can easily be changed to 12 volt) but Martin S might just have a technical reason for asking the question. And I am just curious why it is referred to as single/three phase in the first place. Ok I've got to own up - I'm also building up a Matchless lightweight 350 that uses many parts as the AMC's lightweight Norton's including the Wipac alternator. 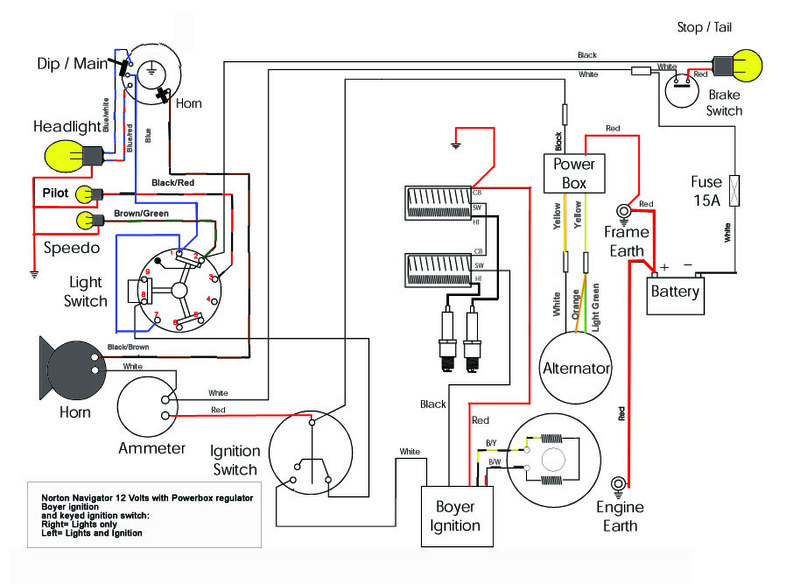 On the owners site some has very kindly published instructions on up grading to 12v and boyer ignition. With this upgrade he has connected the stators 3 wires to a 3 phase reg/rectifier unit. How this works I don't know but apparently it does but the usual manner is to connect two of the said wires together. My guess is that 6V +6V +0V = 12V. (Three outputs wired in series via the reg/rectifier). Now Al is sure to say that I'm talking gibberish and he might be right. There is sound advice here--all British bike alternators were single phase as I understand it--until some of the later Triumph twins using an RM24 stator. There was a Lucas RM 14 small diameter rotor and stator--one finds them at jumbles--the magnets look like they are inset in brass--little brass lines round them --very durable but one cannot get the stators. They can all be converted (bar the CDI ones with lots of wires) to 12 volt by joining two of the wires together. Some bikes had this as standard--those that were still using the RM 19 unencapsulated stator. The later RM21 was two wires (single phase) and was plastic encapsulated. The three phase ones go back to three wires. They are all either six or 12 volt and differ in terms of their output in wattage (an RM24 is 180 watt 3 phase)--I have them on all my Triumphs--My BSA has a single phase RM21 that was once on the older Triumph. My Norton Navigator has a wipac rotor and a lucas stator (you lose output due to the big gap) that is said to generate 200watts. Even the little RM 14 can be converted to 12 volts but batteries need to be charged frequently is the lights are used a lot. I’ve joined two of my alternator wires together and connected them to a modern reg/rect, that gives me 12v dc which has improved the lighting no end, got rid of the resistor wire and enabled me to fit a Boyer ignition. It’s all on Al Os website. Easy job and worth the effort! I agree with Dan, I converted my 64 Navigator to 12v and Pazon electronic ignition with Al's advice and it has transformed what was already a good bike. You can find lots of advice on his website - I've attached some of it to give you a feel for what is a straight forward job - including a representative wiring diagram and the Pazon manual which I found invaluable. I used one of his A1 Reg voltage regulator / rectifier and a separate capacitor rather than the Boyer Bransden Power box. I found a 5 minute phone call to Al clarified the few questions I had after reading his guides and the whole job took about two hours. Good luck! Have you had permission to venture onto this site Martin? Yes Colin - I do - this year is 25 years of membership although I've not bothered with lightweights before. Now listen up-Wipac never made a 3 phase alternator. 3 wires does NOT mean 3 phase. Nice to see above people quoting my words, I must be nearly famous. Replace the Lucas (1 cylinder and also 2 cylinders). In my 16h works very well. (It is a little expensive, more than 700 euros...). Thanks all for the replies and Alan - what is it that's wrong using the 3 phase reg/rec? - seeing as I don't understand the difference in the workings of a 3 phase unit over the single phase one. So what is wrong with using a 3 phase reg/rect on the Wipac 3 wire stator? Good question. The single phase reg/rect has a 4 diode bridge rectifier, while the 3 phase has a 6 diode bridge rectifier. In one respect this would appear to work, but as a seller of these devices if I knew it was being used other than intended then if it should fail I would quote that it was used outside of its intended parameter therefore any guarantee is null and void. So if it works then you are 'getting away' with it.